Darth Vader is a stickler for security. He demands it. Do you remember that time when a ragtag group led by an old man snuck onto the first Death Star and it eventually led to the space station's destruction? Yeah, let's just say that Darth Vader doesn't want to take a second chance after that fiasco. You can bet that he's set up some more security precautions for entry into any portion of Death Star II. We're talking magnetically sealed doors that require ID badges and proper clearance to open. 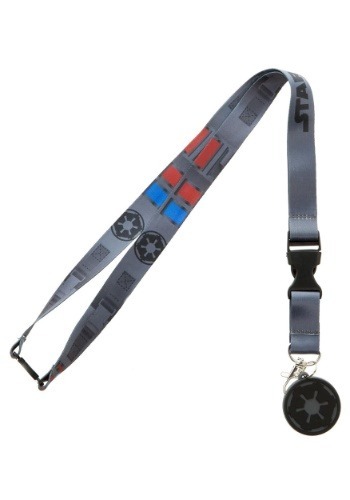 He's issuing one of these Star Wars lanyards to all Stormtroopers stationed on the second Death Star. Of course, you can still use one like it to replace your plain old lanyard for work! This Star Wars Darth Vader lanyard is inspired by the iconic villain from the original trilogy. It has the Imperial crest along the ribbon, but it also has a matching charm based on the same symbol attached to the bottom. It also has red and blue details printed on it that resemble Darth Vader's chest armor. Finally, the included clear sleeve lets you slip your own ID badge right into it. It's the perfect upgrade to bland and boring lanyards. You can use it for work or special events!